Four women gave sermons, compared with 32 by men, with no mention of the faith's Heavenly Mother deity. 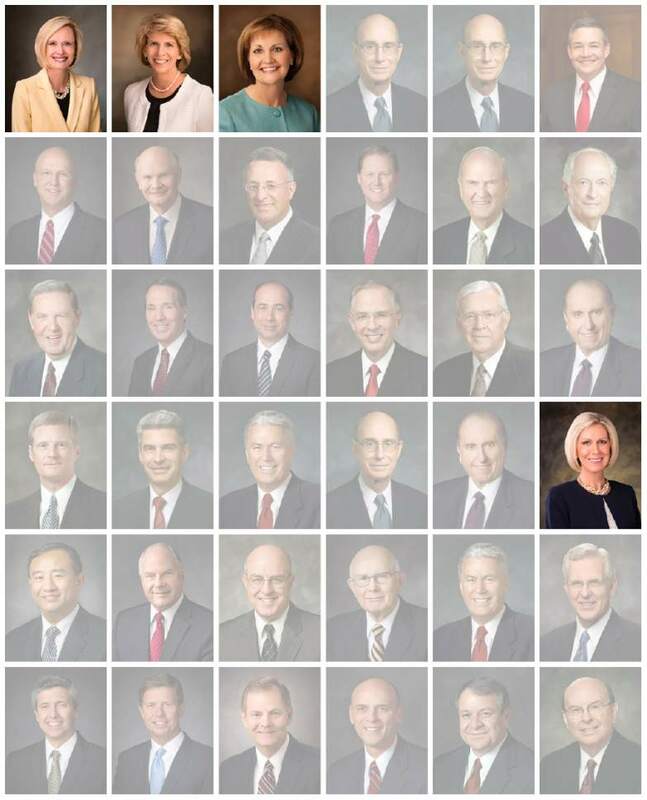 photos courtesy of the LDS Church These photos show all of the people who spoke in General Conference starting with the General W Photos courtesy of the LDS Church These photos show some of the people who spoke in the recent General Conference in April 2017.
photos courtesy of the LDS Church These photos show all of the people who spoke in General Conference starting with the General Women's Session on March 25, 2017. The photos are presented in the order the speeches were given. Of the 36 speeches, four were given by women. They are Bonnie H. Cordon, Carol F. McConkie, Linda K. Burton and Joy D. Jones. Photos courtesy of the LDS Church These photos show some of the people who spoke in the recent General Conference in April 2017. The photos are presented in the order the speeches were given. Of the 36 speeches, four were given by women. They are Bonnie H. Cordon, Carol F. McConkie, Linda K. Burton and Joy D. Jones, who is shown here. To plenty of Mormons, the just-completed LDS General Conference may have signaled a troubling trend, with its lack of female speakers and its failure to recognize the faith&apos;s female deity. For starters, only one woman delivered a sermon on the final weekend of the twice-yearly gathering. That veers from a tradition in place since the early 1990s of including at least two female speakers over those two days. This time around, Joy D. Jones, president of the Primary for Mormon children, was the sole woman who stepped up to the pulpit Sunday  with the exception of Neill F. Marriott, second counselor of the Young Women general presidency for teenage girls, who offered a prayer. And though the Utah-based Church of Jesus Christ of Latter-day Saints named a new Relief Society presidency  Jean B. Bingham, president, with counselors Sharon Eubank and Reyna I. Aburto  the three who will be leading the global LDS women&apos;s organization did not offer even brief remarks. Some note that three female leaders addressed the women&apos;s meeting (now deemed the conference&apos;s first session) a week earlier, but that still meant hearing from four females and 32 sermons from men. "As a 33-year old woman fighting hard to use my voice and find examples to pattern my voice after, particularly within the church, I don&apos;t much care about any of the explanations that might be given," writes Ashley Mae Hoiland, who goes by Ashmae on the Mormon blog By Common Consent. "The fact is that this vast oversight is hurtful." Though the California Mormon mom can work through the issue, she says, "it is disempowering." It sends a message not only to adult LDS women like her, she writes, but also to her young children  "who sat in their [makeshift] forts and did their best to watch with us"  that women "do not have a place, except in the darkened seats of the audience where they can listen." The history of LDS women preaching at large Mormon gatherings has not followed a single pattern, writes Janiece Johnson on the Juvenile Instructor blog. In October 1929, church President Heber J. Grant unexpectedly asked three women presidents out of the congregation to speak  Louise Robison, Ruth May Fox and May Anderson. Grant then remarked, "We have listened to a great many testimonies from our brethren during this conference. ... We shall now call on some of our sisters." According to minutes, Relief Society (RS) President Belle Spafford, Johnson reports, "spoke in the [all-male] priesthood session of General Conference in 1946, teaching and encouraging bishops to work in a partnership with the RS and utilize the expertise of RS presidents." The pattern of two women speaking at each conference took root in 1994, the historian writes. 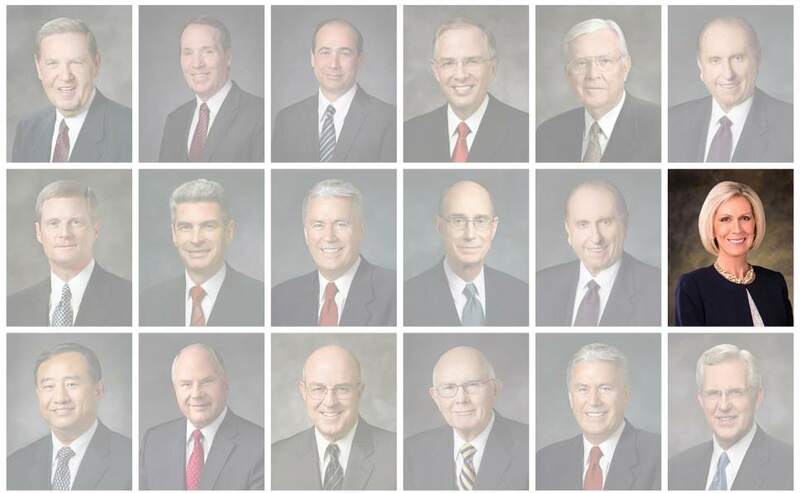 "The schedule further normalized in 1998 with women usually speaking in the Saturday morning and Sunday morning session, though still with a few exceptions. In 2002, the deviation from the norm was three female speakers." And, of course, women first offered General Conference prayers in 2013. So, when it comes to the most recent meetings, was the shortage of women this time intentional or a scheduling oversight? Church spokesman Eric Hawkins had no comment about the number of female sermons, saying only that the governing, three-man First Presidency "assigns the speakers" and "there are no quotas." Another noticeable absence during this April conference was Heavenly Mother. In his Sunday sermon, apostle Dallin H. Oaks explored the Mormon understanding of the so-called Godhead  God the Father, God the Son (Jesus Christ) and the Holy Ghost  all three identified as males in LDS theology. "Because we have the truth about the Godhead and our relationship to [the three personages], the purpose of life, and the nature of our eternal destiny, we have the ultimate road map and assurance for our journey through mortality," Oaks said. "We know whom we worship and why we worship." But the longtime apostle made no mention of God the Mother, who Mormons believe partnered with God the Father to create all human beings, male and female, as spirit children. "This understanding is rooted in scriptural and prophetic teachings about the nature of God, our relationship to deity and the godly potential of men and women," according to an official LDS Church essay on the topic. "... Prophets have taught that our heavenly parents work together for the salvation of the human family." At a General Conference just 18 months ago, apostle Jeffrey R. Holland offered a touching tribute to biblical mothers and Mormonism&apos;s supreme mom: "To mother Eve, to Sarah, Rebecca and Rachel, to Mary of Nazareth and to a Mother in Heaven I say, &apos;Thank you for your crucial role in fulfilling the purposes of eternity.&apos; "
For this conference, Ordain Women (OW), the grass-roots group seeking female ordination in the LDS priesthood, launched a social media campaign, titled "Imagine the Possibilities," envisioning more women&apos;s involvement. On Sunday morning, OW leader Bryndis Roberts was live-tweeting the conference and noticed the LDS Church&apos;s Twitter account had blocked the feminist group from receiving the faith&apos;s tweets. "It was hurtful," Roberts says. "We are part of the church, and it was a blow not to be able to participate in what the church was putting out." A church spokesman says the block has since been removed. That&apos;s a relief to Roberts, a churchgoing Mormon in Atlanta. "I believe the church is led by men of God," she says. "We want to hear what they have to say."